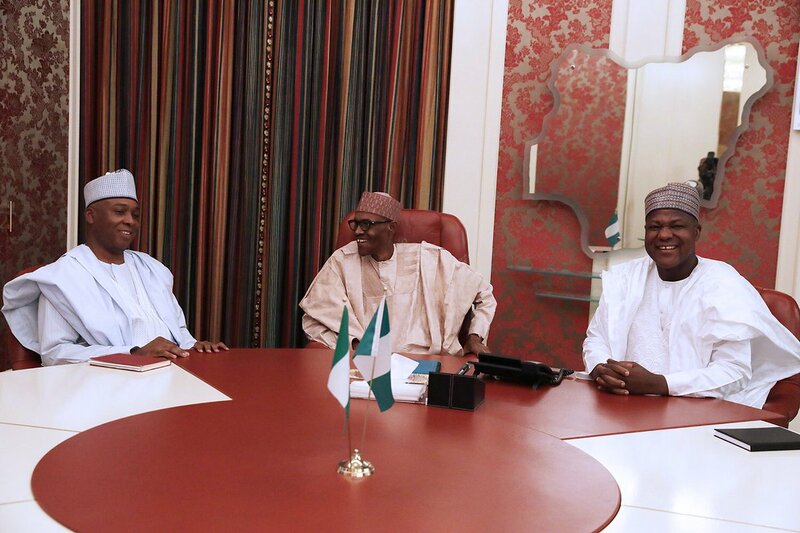 Buhari meets Saraki, Dogara behind closed doors – Royal Times of Nigeria. President Muhammadu Buhari on Monday in Abuja met separately, behind closed doors, with the Speaker of the House of Representatives Yakubu Dogara and the Senate President Bukola Saraki. The president first met with the Speaker before meeting the Senate President for about 40 minutes each. It was gathered that the two meetings were part of efforts to address the seeming strain relationship between the Presidency and the National Assembly. The meetings also discussed the progress reports on the 2017 budget proposal, Senate’s amendment of the Electoral Act and other national issues. The two Presidential Aides for National Assembly Matters for the Senate and House of Representatives, Sen. Ita Enang and Kawu Sumaila, respectively, were earlier sighted going into the president’s office. The Senate President and the Speaker, who both spoke to State House correspondents after the meetings, said they had “routine consultation’’ with the president. Saraki said the relationship between the two arms of government was cordial. He said, “The relationship is very cordial, you cannot examine (the National Assembly) by one or two issues. That is the point I’m making. You cannot examine (the relationship) based on NDDC or examine it based on EFCC. “We have other issues like the Ministerial (names) we are going to work on and the amnesty we will soon work on. We have the budget that is more important, we have INEC, we have PIB, we have so many things and I think it is a mixture of all that that should guide us. On the six months suspension of Sen. Ali Ndume by the Senate, Saraki said he had no power to recall him as being advocated by some individuals and groups. Also speaking on the outcome of his meeting with the president, Dogara dismissed the assertion that he was in the Villa over crisis between the executive and the legislature. He said, “It baffles me when people see you visit Mr President, the assumption out there is that something is going wrong. Nothing is wrong, it is just a routine consultation. “You might look at it as crisis but I don’t look at it as crisis. You know I have always said this that as a government our value will be the problems we have solved. He said: “This is a democracy we are running and we have to open the space to civil society, to everyone who feels aggrieved to be able to air his grievances.